Tua Tagovailoa has been the talk of the college football world since the final play of last season, overshadowing the guy who caught his legendary pass. But DeVonta Smith has gotten a hero's treatment back in the small pocket of LSU country where he grew into one of Amite's favorite sons. AMITE CITY, La. – DeVonta Smith only lets one man cut his hair, and so every few weeks, Vincent Sanders makes the five-hour drive to Tuscaloosa for 20 minutes of work. Smith’s hairstyle is not elaborate or complex. No braids, no afro, no intricate shavings. On a Tuesday afternoon before Alabama’s fourth day of camp, Smith points to his closely cropped hair that in three days will go from short to shorter during another one of Sanders’s visits. This is peculiar even by south Louisiana standards, a barber hauling 300 miles to perform a trim. But the relationship between these two people—a 19-year-old Alabama receiver and a 47-year-old hulking hairstylist—runs deeper than client and barber. 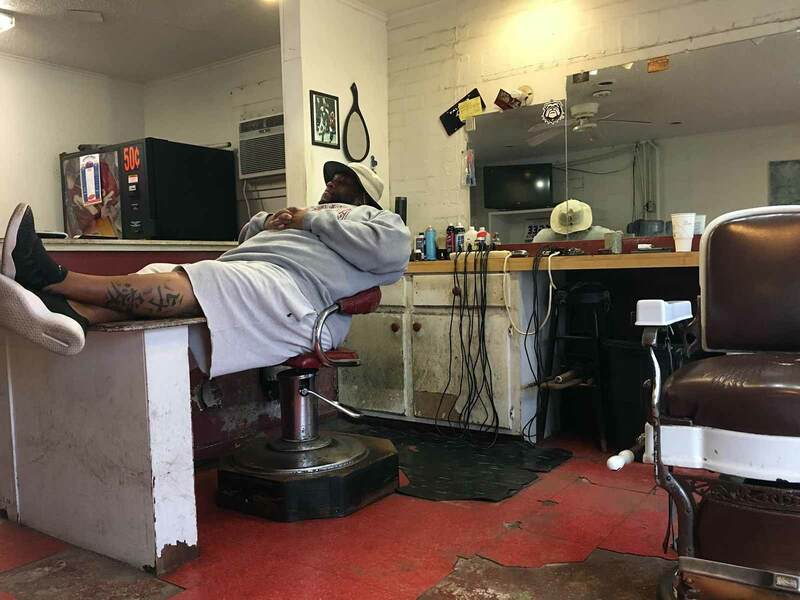 Only from inside an aging barbershop in a community of roughly 4,000 can their bond be understood. George’s Barber Shop is tiny, smaller than a studio apartment, with white cinderblocks for walls and three swiveling, weathered barber chairs fixed into a fractured tile floor. White cabinets have turned gray with grime from more than 50 years of cutting hair here, an operation passed down from Sanders’s father, George. This is more than just a barbershop. It’s a place where young, sometimes underprivileged athletes come to enhance their recruitment through Sanders and his various connections. He brings them to camps, exposes their talents to big-name coaches and mentors them, all from his little shop. The newest items in this place are all football-related. A flat-screen television sits atop a cabinet (after all, you gotta watch the game). Schedule posters for Texas, Texas A&M and Miami hang on the far wall, and a Georgia sticker is affixed to a mirror that stretches eight feet across another wall. 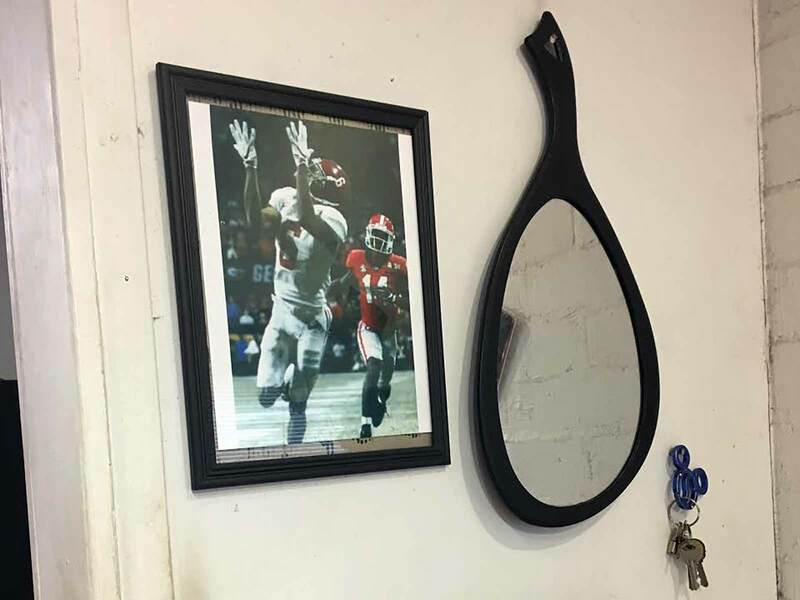 Near the mirror is a photograph of the most significant football moment to come out of this shop: The Catch. That’s what it is called here in Amite (pronounced ay-MEET, with the "City" at the end of the area’s formal name commonly omitted by locals). The community is split on cultural lines, where country (it’s just 23 miles from the Mississippi border) meets Cajun (it’s 65 miles north of New Orleans), and where blacks and whites, like in many cities in the Deep South, have their own parts of town. 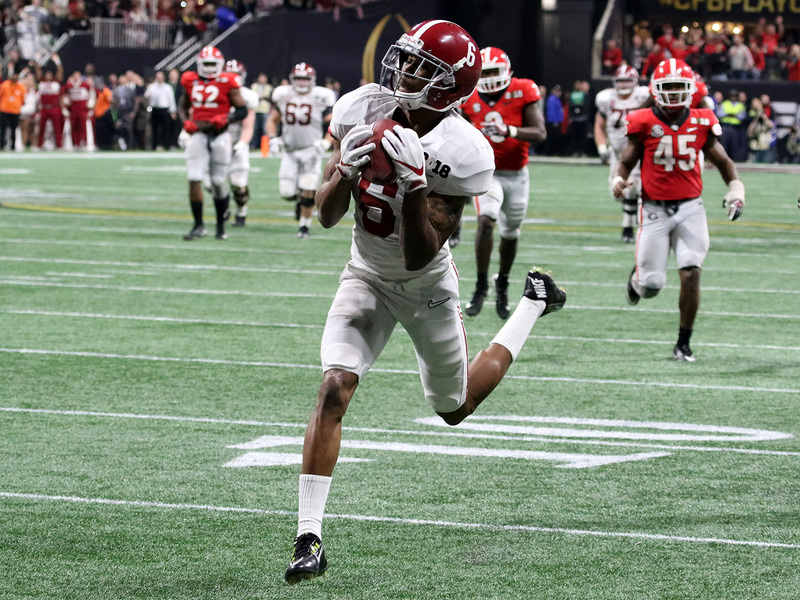 The Catch won Alabama a national championship, and that wouldn’t be such a good thing here if it were not made by one of Amite’s sons, DeVonta Smith. They hate Alabama here, but they love Tay, or Tay-tay, or when he was real little, because he was so skinny, Thinuine. The Catch really left this place emotionally befuddled. Should we be sad or happy? It’s Alabama, but it’s Tay. Everyone talks about the guy who threw the 41-yard pass on second-and-26 in overtime that won Nick Saban his sixth national championship—he won his first in Baton Rouge, an hour away from here—but they don’t talk much about the guy who caught it. College football’s offseason has marched along to the beat of Alabama’s starting quarterback competition, with a hyper-focus on what comes next for Tua Tagovailoa after a breathtaking end to his true freshman season. The other half of that play—Smith caging the football with his gloved hands at the two-yard line and then waltzing into history—is not buried here. In fact, Amite held a parade (it is, after all, Louisiana) for Tay and Shyheim Carter, an Alabama cornerback from Kentwood, Amite’s sister city 15 miles north. They rode the two players in the backseat of a convertible down streets that bleed purple and gold, celebrating a championship for the crimson and white, all because of The Catch. Two months before The Catch, Smith scored the game-winning touchdown against Mississippi State, a 26-yard pass from a different quarterback, Jalen Hurts, to cap a different comeback. That’s what people forget, Sanders says: The true freshman made two game-winning catches for the Crimson Tide. Still, he’s not a household name, in part due to the mere six catches for 93 yards he mustered last season outside of those two key touchdowns, and he hasn’t found himself on many preseason honors lists. But here in Amite, Smith has been a household name for years. “It was ‘Tay did this' and 'Tay did that,’” says Carter, Smith’s friend since childhood. Did you hear about Tay’s windmill dunk? Have you seen his vertical leap? What about that touchdown catch last Friday night? Before his do-it-all role at Amite High—he played cornerback, receiver and kick returner, leaving him on the field for roughly 90 of every 100 snaps—Smith built his reputation at Butler Town Park as the scrawny kid who just wouldn’t go away. No matter how much bigger the other boys were—Smith weighed 120 pounds as a high school freshman—he kept returning, hopping the shabby chain-link fence separating his house from the park’s western edge, a concrete slab with two rickety basketball hoops. Nah, they used to tell him, you’re too little. The next day, there was Tay, back again. It was tough enough that Christina Smith-Sylve, Smith’s mother, implemented a rule: When the streetlight next to the family’s house illuminates, Tay comes inside. Amite is full of “trouble spots,” says Sanders, and plenty of highly touted athletes have ended up in them. This only “made me go harder and do the right things,” Smith says. Many of the residents are related in Butler Town, a neighborhood at the southeast corner of Amite. Smith’s cousins, most of them three to five years older than him, were the parkgoers who often bullied him. His uncle, Fat, (because everyone here has a nickname) worked him out of a habit of catching passes with his chest. I’m not going to stop throwing it hard until you start catching it with your hands, Fat told his nephew, who returned home many nights with at least slight bruising on his chest. Smith smiles now thinking about it. “It used to hurt,” he says. Butler Town is a mix of trailers, dilapidated houses, abandoned shacks and modest homes, like the one in which Christina raised Tay and is raising his 12-year-old brother, Christian: uneven floors and seven-foot ceilings, three bedrooms shoved into a space no larger than 800 square feet. The neighborhood is south of Oak Street, the main thoroughfare that slices Amite in two and serves as the unofficial racial dividing line in a town with a near 50/50 black-white split. Amite High, four blocks from Smith’s home, is at least 90% black, and its grass football field on this day is patchy and yet to be painted with yard lines. “We have to do that ourselves,” says Sanders, who volunteers as a coach between his hair appointments. “They’ve got artificial turf over there.” Over there is Oak Forest Academy, a private elementary and high school on the north side of Oak Street. “And there are two at LSU!” Sanders says. 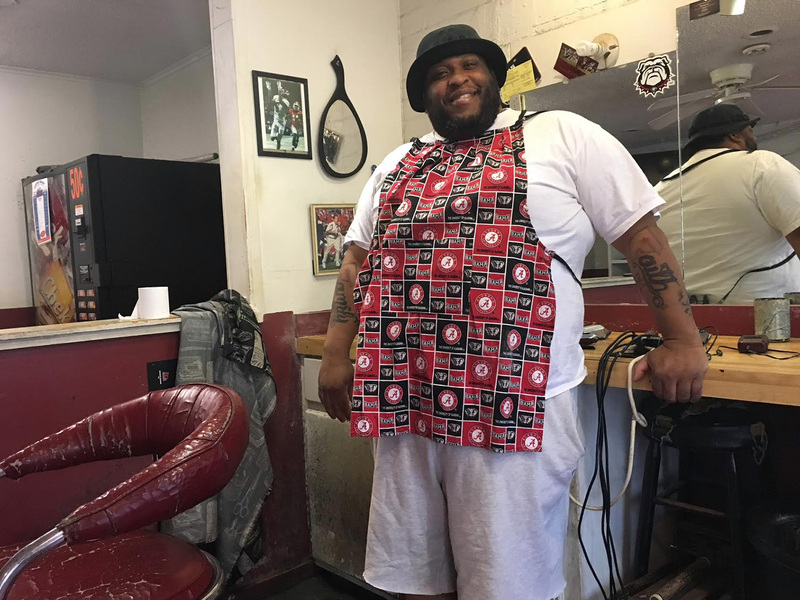 Sanders turned his barbershop into the hub for an organization he created a few years ago called BEAST 1 Athletics, an outfit that promotes, supports and markets high-caliber athletes, mostly from this region. He says that 22 of “his” 28 kids received Division I athletic scholarships. He has shone a bright light on an area that college coaches used to drive straight through en route to New Orleans or Baton Rouge. In the early years, he’d beg coaches to swing by to see the best players in Tangipahoa Parish, where Amite resides. Tangipa-what? they’d reply. Smith believes he’s playing at a major college program because of Sanders, the man who stumped for him around every corner and at every camp. Sanders does not charge families for his services, using revenue from his barbershop for the most expensive part of his organization, bringing players to college camps (but only those with a 3.0 GPA or better). One of his most notorious camp trips was a week-long haul with Carter, Smith and Josh Perry, an Amite native now playing defensive back at Memphis who once had verbally committed to Alabama. Piled into Sanders’s pickup truck, they stopped at multi-day camps at Alabama, Georgia, Clemson and Tennessee, soemtimes napping in the bed of the truck and creating a bond that exists to this day. Smith is tighter with Sanders than the others. He practically grew up in George’s Barber Shop, where George Sanders trimmed Smith’s hair for years before Vincent took over. But Smith’s relationship with an Alabama support staff member is just as tight: Sam Petitto, the Tide’s director of personnel operations, is an Amite native who went to school with Vincent Sanders and has been in Smith’s life for years. As the ninth-ranked receiver and the second-best player in Louisiana in the 2017 class, Smith’s decision to leave the state for an SEC West rival ruffled feathers locally, but his family, as you might expect, is all in on the Crimson Tide, even if some of them spent their life rooting for the Tigers. Sidney Smith, Tay’s grandfather, admits to despising Saban for leaving LSU in ’04 and subsequently leading the Tide to a seven-game winning streak in the series. And now? “I love Alabama,” Sidney says with a smile. The same goes for Smith’s parents Christina, a social worker, and Kelvin Dickerson, a manager at a car detail shop. “I’m still an LSU fan,” Christina says, “but my heart is at Alabama.” Today, Smith’s home brandishes an Alabama flag out front, and her vehicle proudly supports a Crimson Tide plate. Most of the heckling she receives is usually in good fun. Smith-Sylve and Sanders were there in Atlanta for Alabama’s 26–23 double-overtime win over Georgia, but Mom missed The Catch while chatting with someone behind her in the stands, something she shares with embarrassment. “I had to watch the jumbotron replay,” she says. Sanders, meanwhile, watched the play, called “Seattle”, unfold. Smith raced by UGA cornerback Malkom Parrish, while Tagovailoa froze Bulldogs safety Dominick Sanders long enough to leave Smith open to bring in a perfectly placed football. Back in Amite, grandparents Sidney and Ethel Smith were so frustrated by Alabama’s missed field goal to end regulation that they switched off the television, only to hurriedly cut it back on just in time to see The Catch. “There was no sleep that night,” Ethel says. Kelvin was late for work the next morning. Smith moved past The Catch quicker than the town of Amite. In fact, when first approached by Vincent Sanders in the post-game madness, Smith chastised himself for not blocking better, and he rejected the game ball. Sanders reminded him, You just caught the pass to win the national championship. For the rest of his life, he’ll be known for that moment. Is there a way to top it? “I don’t worry about that,” Smith says.